You are invited to the opening ceremony of 'World Wetlands Day 2015' photo exhibition at Dhaka Art Center, 12th February 2015. Exhibition will be continue till 14 February 2015 everyday 3pm to 8pm. The Center is proud to sponsor the work of both amateur and established artists through its studio program. 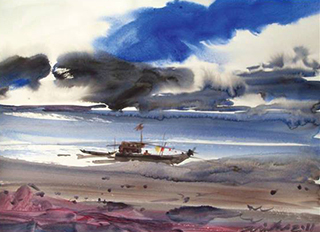 Radisson Blu Water Garden Hotel Dhaka (RBWGHD) brings you watercolor exhibition by Mintu Dey, in collaboration with Dhaka Art Centre on 11th January, 2015. Exhibition will continue till 5th March 2015, everyday 12 pm– 8pm. In an informal gathering at Dhaka Art Center, photographer Sayeed Siddiqui Rumi handed over a check as donation to Mr. Ramendu Majumder, the Chairperson of board of trustee of DAC on 27 April, 2012. 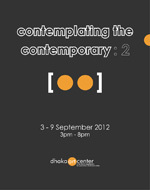 Dhaka Art Center started its journey for promotion of art and artist. 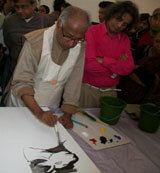 With 101 artists, Dhaka Art Center held a camp and then an exhibition at the Dhaka Art Center premises. The event was sponsored by Aamra Group and Depart. The event took place between 10th to 19th of April, 2010.